In 2008, Dear Esther asked players to do more than just press buttons on a controller. The game asked them to use their imagination to build a personal narrative. Eight years later, contemporary titles like Hitman and Mafia III are also catching on to the value of imaginative play. I don’t think the entire experience of playing a game is found entirely in, well gameplay. While a majority of our focus rests in the moment to moment tactical decisions that we can carry in a game (“Do I shoot this barrel or do I shoot this dude?”), I think an important process happens offscreen as well in our imaginations. 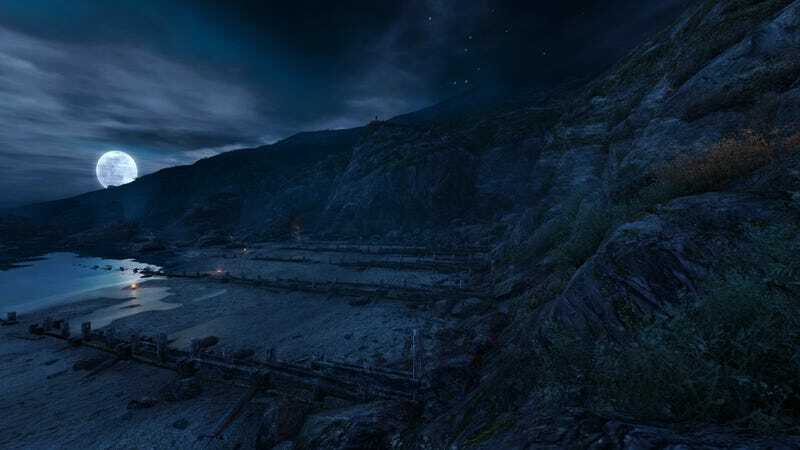 Dear Esther is light on any concrete plot. It offers just enough to give you a sense of what has occurred. You are a hermit on an island. Why? Well, that’s ultimately up to you. The game randomizes certain dialogs and key moments. This forces you to come up with a story in your mind and ascribe meaning to your journey and to the space. The filling in of narrative gaps is entirely in your mind. This process is not adjacent to play; it is an essential part of play itself. In Hitman, a surprisingly similar process occurs even though there’s a lot more to do than just walk around. The levels in Hitman are meticulously detailed and full of NPCs with their own miniature narratives. At any given moment it is hardly possible to track all threads. Learning is iterative in Hitman, spurred on through continuous exploration of the game space. Plotting routes and finding the stories within the landscape isn’t too far removed from Dear Esther although there’s no narrative reshuffling. Once you know an NPC schedule, there’s essentially no deviation. Still, a primary component of Hitman’s play does not occur on screen. It isn’t found in silent assassinations or donning disguises. It comes from observing a place and understanding what that place is and how it functions. Understanding the context of a room and how it relates to your targets and to you as a player. The attribution of context is also an offscreen, imaginative process. You figure out Agent 47's relationship to a space through many variables. It is found in the outfit you wear. It is found in time itself, where you are and when you are there. You internalize these things in order to get a better grasp for the world and how it functions. The game goes a long way to defining Lincoln’s relationship to these space through game systems. As an example, loitering in an affluent part of town might trigger police response. The abstraction of real world biases into gameplay systems is an imperfect way of capturing the complexities of systemic issues in reality but it positions the player clearly within certain places in the game world. It provides context. What results is another off screen bit of mental engagement as the player ascribes meaning to these places and develops feelings about them that can then be reflected in the game. Examining a space might reveal stories to further stress the space. A well placed Confederate flag signifies a lot and build a narrative in the player’s mind. I’m not saying these games are equivalent in their effectiveness but I do believe they all highlight an under-discussed aspect of playing a game: thought. In what ways do we we provide context by filling in narrative gaps and fully manage to immerse ourselves in game worlds? These games are case studies in an activity we manage every time we boot up a game. Next time you leap into a game, consider taking a moment ask where you are, what that place is, and what the history might be. How do you know? How does the game tell you these things? I think you’ll be surprised by how much you’ll be able to determine. And how much those discoveries will ground you in the game.